You are here: Home / Dogs / They’re Back! 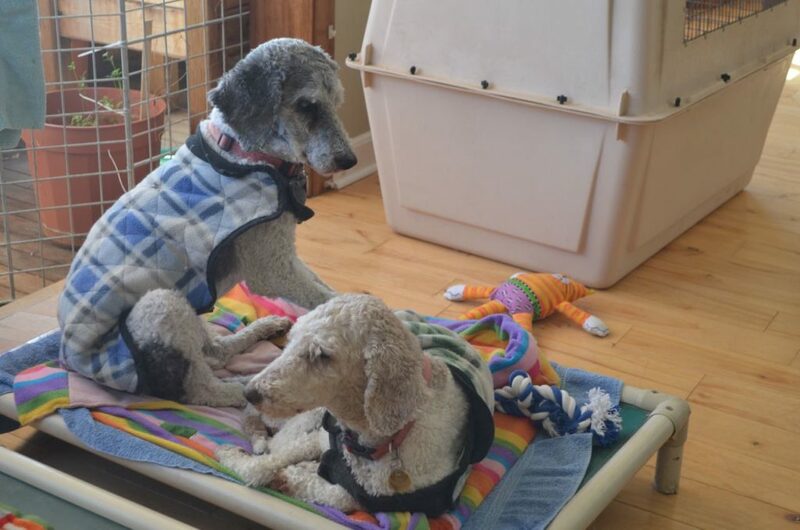 Long-time blog readers may remember these two girls — the blind Poodle sisters, Molly and Priscilla. They came to us way back in 2008 when we were in Montana, after being rescued in awful condition from a puppy mill situation in Texas. (A photo in that blog post will show you the shape they were in originally.) They made the move with us from Montana to New Hampshire in 2010, and then in 2011 we adopted them out to a couple in southern New Hampshire. We received periodic updates and photos of the girls with their new family, and just assumed this would be their forever home. But several weeks ago I had an email from the couple, saying that one of their aging parents had cancer and they had to move out of state to care for them … and that they couldn’t take the girls along. They wanted to know if we could possibly take them back. Of course, we said yes, and a couple of weeks ago Molly and Priscilla arrived once again! Rather than the spry, active things they were in 2008, they are now very elderly. It was actually quite a shock to see how much they had aged in the past six years. We never knew for sure how old they were when we first got them … our working assumption was they were young adults, but honestly, no one knew. Right now they both appear to be at least 14, if not older. Molly has definitely aged more than Priscilla, and it’s a very slow, stiff walk with her to go outside. But bless their little hearts, they adapted very quickly to their new routine. It seemed to take them only a few hours before they remembered where they were and who we were. Their first afternoon here we spent a lot of time with them, just one-on-one, hugging them and making over them and doing our best to make sure they knew they were loved and safe. Above all, we wanted them to know they hadn’t been abandoned and were still with family who adored them. They’ve responded in kind, often seeking us out for petting, attention and, yes, dog cookies! Life happens. Luckily, for these two girls, they have you. I’m glad to hear they’re settling in. It must be heartbreaking for their guardians to have to relinquish them, but they know they’re in the best of hands. I look forward to more updates on these two beautiful poodle-sisters. I remember them well from Montana days! Oh, I remember them. Cuties. They are still sweeties. Bless you for being able to take them back. We just never know what life will deal us. Those sweet Poodle’s! How wonderful that their family knew they could rely on you to welcome them back – and how very sad it must have been to say goodbye to them. Glad they’ll have a happy retirement home at Rolling Dog. I knew them as soon as I saw the photo. I’m sure their parents were heartbroken to have to leave them behind. But we know the girls are in good hands and I’m betting some of the doggies who have been there a while remember them and welcomed them back. They look so beautiful in their coats. At least they’re together in a good place with humans who love them and other doggies as friends. It hurts my heart to think what your family is going through to have to part with you. But it must be the best relief know you couldn’t be in a finer place than Rolling Dog Farm. Hugs and comfort to you all. Nice to see these girls again! They do look a bit more sedate than last time I saw a photo of them, but that’s to be expected. Welcome home, girls! Thats what so great about you guys its always a life time guarantee! Those were loving owners to seek you out and lucky poodles to re-land with you two. And your gang up there. Wishing you well and happy Spring. I hope i can find a Rolling Dog farm when I am an old poodle. I remember Molly & Priscilla. Welcome back, girls! I’m sorry their family had to part from them but I’m very happy they reached out to y’all to bring them back to you. I’m sure they know you guys. They look wonderful even if they are aged now. I’m so happy to see a post. I know you cut back but I miss you guys. What a wonderful place where you treat all of these pets like family, and fill their need for love and comfort as well as food and shelter. A very special rescue indeed! what lovely old ladies, they look so sweet! wonderful that they can come and be with you an your amazing pack there. much love! So glad Molly and Priscilla were able to come back for you. I’m sure giving them up wasn’t an easy decision, and I’m glad their people called you guys first. The girls are still so beautiful! Welcome back to your retirement home at the farm, Molly and Priscilla! I am sure your family is sad to have parted with you pretty girls but at least they know that you both are in the best place possible. I’m grateful that Molly and Priscilla’s previous owners contacted you to take them back. That was thoughtful and absolutely in the best interest of the girls. my heart melted reading your words. I loved these two proper Southern ladies. They seemed so demure and and lovable. I am glad they are back where they will be loved and taken care of. .